Button, antiqued copper-finished "pewter" (zinc-based alloy), 11.5mm single-sided corrugated round. Sold per pkg of 50. Item Number: H20-A4143FN Have a question about this item? Button, antiqued copper-finished "pewter" (zinc-based alloy), 18mm single-sided corrugated round. Sold per pkg of 20. Button, antiqued silver-finished "pewter" (zinc-based alloy), 11.5mm single-sided corrugated round. Sold per pkg of 50. Button, gunmetal-finished "pewter" (zinc-based alloy), 11.5mm single-sided corrugated round. Sold per pkg of 50. 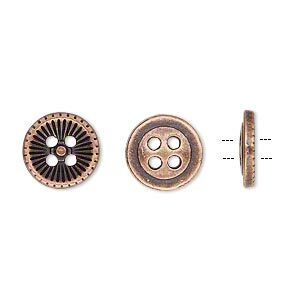 Button, antiqued copper-finished "pewter" (zinc-based alloy), 12mm single-sided flat round with stitched edge. Sold per pkg of 50. Button, antiqued copper-finished "pewter" (zinc-based alloy), 12mm single-sided flat round with Greek key design. Sold per pkg of 50. Button, antiqued silver-finished "pewter" (zinc-based alloy), 18mm single-sided corrugated round. Sold per pkg of 20. Button, antique brass-plated "pewter" (zinc-based alloy), 18mm single-sided corrugated round. Sold per pkg of 20. Button, gunmetal-finished "pewter" (zinc-based alloy), 18mm single-sided corrugated round. Sold per pkg of 20.